You are in: Home › Latest News › Congrats to our first free Kane offer claimant! Congratulations to Peter Whelan of Merseyside-based Discount Heating on being the first to receive a free Kane Gas Flue Analyser worth £399 through our special offer! 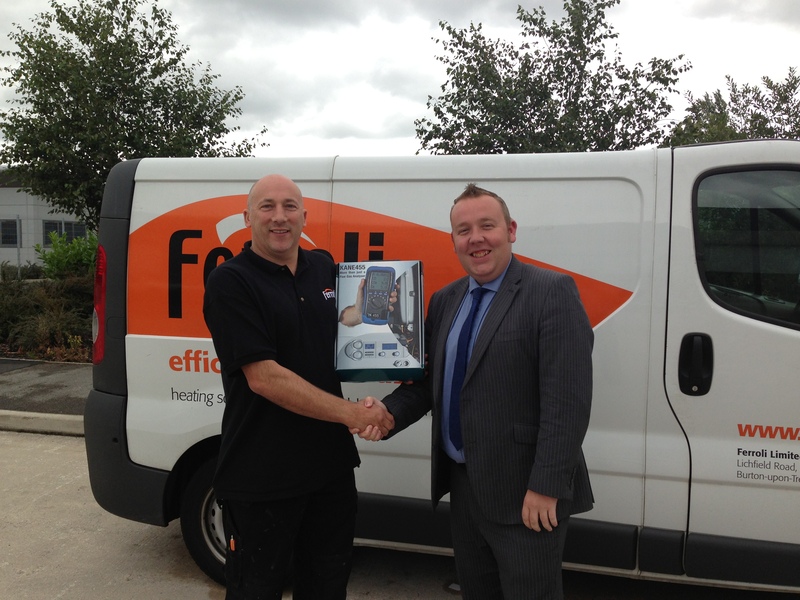 Peter, on the left of this photo with Phil Todoric, Ferroli’s ASM for the North West, is another convert to the Ferroli Modena HE boiler and, after having installed more than six for his customers, he was eligible to claim his free Kane kit. “I was introduced to the Modena at a Ferroli promo event where I met Phil and Ferroli engineer Bob Law,” said Peter. “They explained the features and benefits of the Modena and because it comes at such an affordable price, I thought it was worth trying something new. “I’m so glad I did, it’s proved to be a fantastic boiler for my customers. It represents excellent value because it comes with a 5 year warranty, it’s well built and with only four moving parts, I know it’s going to be reliable. I also really like the compact size as it can be fitted virtually anywhere and it’s very easy to work on with access to all the main components from the front.